Posted on September 28, 2016 at 4:29 am. Land-based casinos have for years tried to find ways to get GenY “millennials” through their doors. Nightclubs, casual dining and bars have undoubtedly worked wonders, but one problem persists: younger generations simply aren’t gambling. Thankfully, one technology company has the answer: skill-based video games. 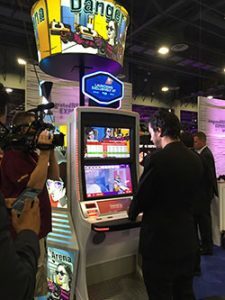 Combining the interactive realism offered by today’s biggest video games with the allure of monetary gain, GameCo, Inc. has developed a series of skill-based video game gambling machines (VGM) it says will attract a new type of casino customer. Having just raised more than $8 million from a number of US venture partners, GameCo is working alongside the world’s biggest game developers and publishers to bring popular franchises into the gambling space, meaning we could soon see the latest PlayStation and PC games get a casino counterpart. The standard VGM is an arcade-style video game cabinet and controller, mimicking your standard arcade machine as opposed to the traditional casino slot. They are single-player games, and generally last around 60-90 seconds. Payouts and winnings are determined by the player’s skill, balanced next to standard casino economics to establish a fair house edge. It’s expected that these machines will soon dominate the US casino landscape in Atlantic City, with game genres such as action, adventure, sports and racing set to hit casino floors before the Holiday season. Jed Katz, Managing Director of Javelin Venture Partners, said GenX and Millennials “don’t play slots”, and that they were more likely to lend their hand at video games. “And while casinos have been attracting those customers with hot nightclubs, bars, and restaurants, it’s only logical that they offer a gambling product that’s attractive and fun for this customer base,” Katz said. While slot revenue is the leading source of gambling revenue in the US, the figure has been dropping yearly for decades. The demographic has remained unchanged, and mostly appeals to older audiences. GameCo could be about to change that with what it calls “The Video Game Casino”. Looking for the best casino experience online? We highly recommend Bovada Casino as safest and the best online casino providing support and the best online experience possible for players from United States.